Performing the 'Shelby Drop' on your classic Mustang is a great, inexpensive way to help decrease the positive camber characteristics of stock upper control arm mounting points. Eliminate the inaccuracies of paper templates and incorrect measurements with our CNC laser cut steel template. Shipped complete with mounting bolts & nuts so you don't have to make a trip to the hardware store. Black oxide plated so it won't rust in your toolbox and will be ready for your next car! Download the instructions below to help you through this simple, effective modification. STUCALDJ6566 has 3.75" control arm mounting bolt spacing and drops 1" down and 1/8" rearward. Typically used on 65-66 Mustangs. 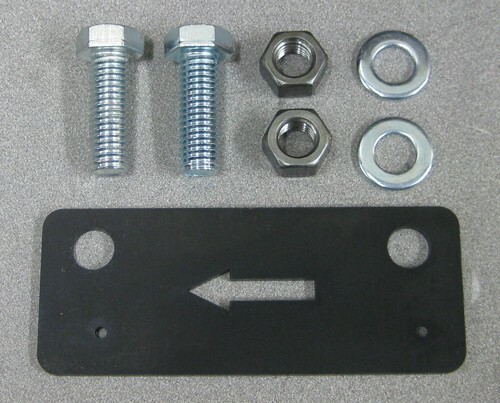 STUCALDJ6770 has 4.75" control arm mounting bolt spacing and drops 1" down. Typically used on 67-70 Mustangs.